I have set up a demo site here. FlexBox is the new alignment and layout tool for modern browsers; it is what you really need to make a site truly responsive and flexible. CSS-Tricks has a good explanation and demo. A little fun is to be had at FlexBox Froggy, which is a game where you help Froggy and friends by writing FlexBox CSS code! Be warned: each level is much harder than the one before, and coding hints given on one level are not repeated again, so make a note of them – you WILL need them to progress!! Which browsers support Flexbox? See here and the table below (light green means partial support – with IE8 and IE9 support hopefully provided by Flexibility). 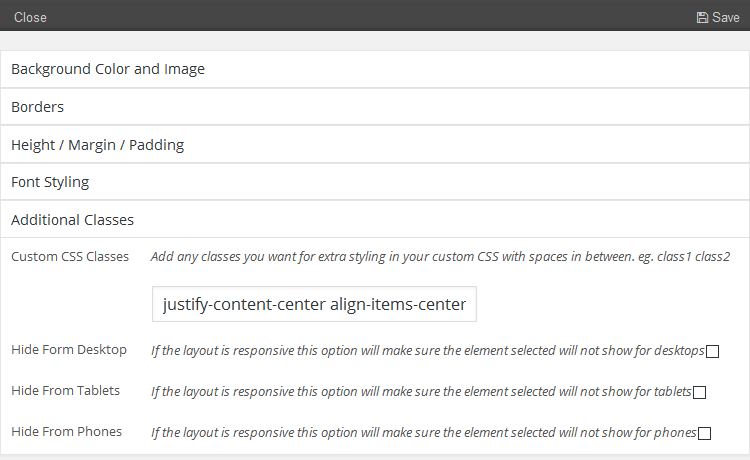 The Ultimatum Layout tools are very powerful, and give you the option of making Full and Partial layouts. Where possible, make as much of your site in Partial Layouts as you can, especially for sections of pages that will be used in more than one layout, and for the header and footer. For the purposes of this tutorial, I need only to make one partial layout for what would be sued as the nav section of a header inn a full layout, which will hold all of the different menu variations I shall make. When making your menu, you would make just the one you want. 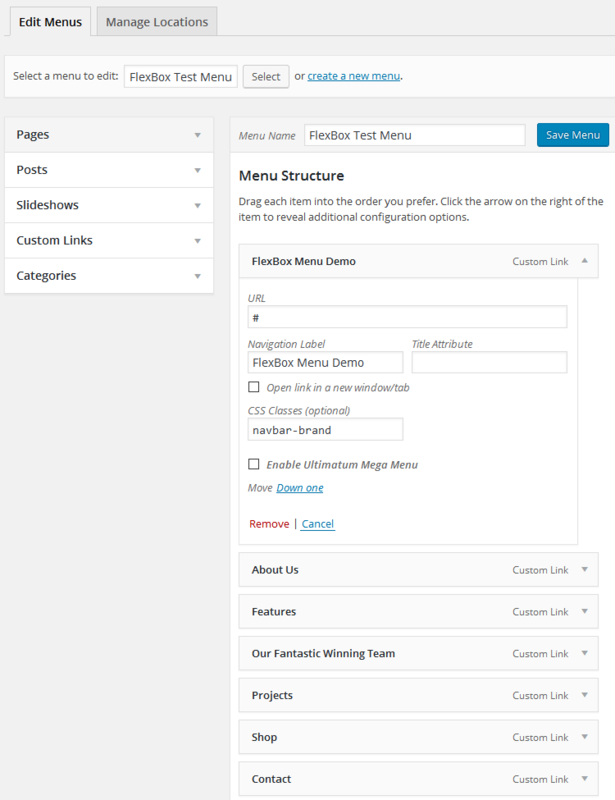 Create and name the partial layout for the navbar; I called mine ‘FlexBox Menus’. Into that insert a row, of the type 100%. Drag and drop the Ultimatum Menu widget into the row. In the screenshot above, you can see how I set my first menu to be centered. The first CSS class sets the horizontal alignment, the second class sets the menu label to be vertically centered (yes, no need for padding). This is the code file that lets you use FlexBox while supporting older Internet Explorer browsers (8 and 9). This is the link for the flexibility.js file (right mouse click and Save Link as … to your local computer). You will need to use ftp to upload this file to the desired Ultimatum child theme folder on your server. You will need to load your flexibility.js file (conditionally for Internet Explorer 8 and 9 only), the additional FlexBox menu stylesheet and, if you use one, the external custom css stylesheet for your site. This is done in your child theme’s functions.php file. To help you find and edit this, you might find it useful to load a free WordPress plugin called WP Editor. One thing to note about WP Editor is that it takes over as your default Post/Page editor, so if you do not want it to do this, after you install and activate it, go to the plugin’s settings and select the Posts Editor side tab and set ‘Enable the Posts Editor’ to ‘No’ and save. I have put comment lines in to explain what the code is doing. Great write-up and tutorial, Trevor! Sorry to be thick but what is this a new navigation menu? What is the advantage of this am I missing something. It allows a lot of alignment and sizing options that are very hard to do without flexbox. For example, the justified menu where they re-size according to the page width, but you can switch the re-sizing off, for example, the first and last itesm.